Santec is one of the leading manufacturers and exporters of a wide range of industrial hydraulic presses. Any such industrial system requires complete technical support and prompt after-sales-services, Santec provides 24x7 post sale support to meet any technical support required by the customers. The after-sales service operations are designed to substantially increase the efficiency of the customers' plants and production capacity. In lieu of its exceptional after-sales service, Santec gets solidifies its customer loyalty. Santec offers tailor-made inspection for the analysis and ranking of the its equipment or plants. Cost-effective and reliable, these inspections are subjected to generate information regarding the types of potential damages that may inflict on the plants. Using advanced tools, the experts collect the data from inspection and analyze it with known industry facts and determine the potential problems. This provides the customers to focus on the maintenance resources in a timely manner. Santec provides supervise various production processes at customers' facilities to verify the conformity of the plants for proper functioning, as per the requisite codes and standards. Shop supervision services extend a dual benefit. While they provide corrective measures to the working plants, they also ensure preventive measures. On-site and off-site inspection is done with expertise to handle any sort of problem. Santec provides its clients with a range of project management services to enhance the capacity; to modify the existing specifications; to fine-tune the plants as per new codes, etc. The company assists customers through each stage of the project right from conceptualizing to the commissioning and verifying. 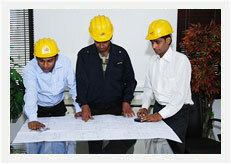 Santec offers its services for auditing the machines and plants on periodic basis. Auditing services involve technical audits being carried out at vendors/suppliers facilities. The service scheme consists of a range of tailor-made programs including single visit as well as operating complete vendor appraisals and control schemes.